BWSSB JE Hall Ticket 2019 is OUT Now!!! Candidates who had applied the BWSSB Examination dated on 20th, 21st, 22nd, 23rd March 2019 can check their bwssb.gov.in Hall Ticket 2019 from the Official website. Recently, the officials of the Bangalore Water Supply And Sewerage Board (BWSSB) released the Admit Card for the posts of Meter Reader, AE, JE, Assistant, Chemist & Other Jobs (Group B & C Cadre). Moreover, many of the eligible candidates have applied for it. And now, they are eagerly waiting to attempt the test. Also, the scheduled BWSSB Exam Date 2019 is given on this page, which is to be conducted on 20th, 21st, 22nd, 23rd March 2019. Candidates who are ready with the registered number and date of birth can soon download it when the officials release the exact date on bwssb.gov.in. We have given the steps and the direct link to download the BWSSB JE Admit Card at the end of this page. Well, the officials of the Bangalore Water Supply And Sewerage Board (BWSSB) had planned to hire candidates through a certain procedure. And that was the BWSSB Selection Process 2019. So, candidates can directly check this section to get all the suitable rounds. Those who qualify in the initial rounds will only move to the other levels of the recruitment process. Check this section to know what information does the bswssb.gov.in Hall Ticket 2019 contains. And if any of you observe any discrepancy in the Admit Card 2019, then they must intimate the issue to the higher authorities. So that they will rectify them and revert you through your email. Carry any one of the copies of the below mentioned documents along with your BWSSB JE Admit Card 2019. And the invigilators are not even ready to enter the candidates who are without their hall ticket. So, check the below listed documents and attend the Bangalore Water Supply And Sewerage Board Exam mandatorily. We heard that many of you are eagerly searching for the BWSSB JE Admit Card 2019. So, to help you at any moment by avoiding issues, we have gathered all the fine steps to make you download it. So, do follow the below instructions to get the admit card straightforwardly. Candidates move to the official site of the Bangalore Water Supply & Sewerage Board (BWSSB) at bwssb.gov.in. 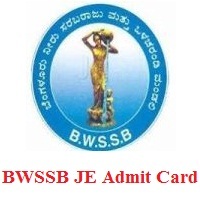 Find the BWSSB JE Admit Card 2019 link on the “Latest News” section. Soon after referring to that link, click on that link. Log in to the page by entering the Registration ID, Date of Birth details and hit on submit button. As per the details provided, your valid BWSSB JE Hall Ticket 2019 will be opened on the screen. Cross check all available information on BWSSB JE Admit Card 2019 and download it. Also, take down 2-3 printed copies of it for further usage. Hope all the candidates have gathered the entire information of the BWSSB JE Admit Card 2019. So, do follow us on our Freshers Now page to get all the single notifications for any government jobs, syllabus, previous papers and the latest updated on results, hall tickets. So, keep on visiting us by bookmarking us @ Ctrl + D.